But that was back when the cabinets were to be painted white. Since then, we chose antique cream cabinets and yet I never thought to change my paint choice. I got a quart of the paint to test on the walls and did NOT like the result one bit. 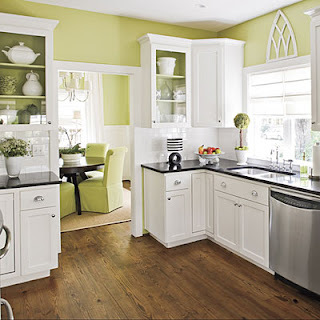 With cream cabinets, yellow and cream floors, and white tile, the citrus color just seemed odd. though computers are notoriously bad for seeing real colors, i think the taupe you like would be an excellent choice. can't wait to see how it turns out! when you started your kitchen project, it inspired me to get the ball rolling on my own (albeit far less involved) kitchen project. painted the walls gray and am trying to work up the gumption to tackle painting the cabinets white!